The Navigator Utilization Field encompasses all functions performed by rated navigator officers to conduct or directly support flying operations, including combat, combat support, and training missions. Inherently included are supervisory and staff functions such as inspection, contingency planning, and policy formulation. B - Squadron Operations/Maintenance Officer. F - Aircraft Systems Flight Evaluation. G - Automated Systems Program Designer. H - Military Consultant to the Surgeon General. K - Instructor for weapon system designated by AFSC. M - Medical Service Specialist (Physiological Training Instructor). Q - Standardization or Flight Examiner for Weapon system designated by AFSC. T - Formal Training Instructor. V - Automated Functional Applications Analyst. W - Weapons and Tactics Instructor. Y - Analytical Studies Officer. Identify navigators serving as instructors in undergraduate navigator training and formal training units (FTU) with a T prefix. Do not award the T prefix to instructor navigators in operational units. Prefix K identifies these instructors and authorizations. In each major weapon system (MWS) specialty, use suffix T to identify navigators serving as Specialized Undergraduate Navigator Training (SUNT) instructors. Only use suffix S to identify electronic warfare officers (EWO) serving as SUNT instructors. 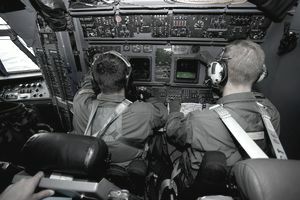 Navigators assigned to duty as Aerospace Physiology Instructors, after completion of formal training, may be identified by prefix M. The office of the Chief, Flight Medicine, Air Force Medical Operations Agency validates positions and awards AFSCs. Identify requirements for staff officers above wing level with a staff AFSC (12X4). Award individuals possessing a qualified AFSC (12X3) a staff AFSC (12X4) upon assignment to a position so identified. Qualification level 3 designates a navigator qualified in the assigned specialty or shredout. Level 2 may be used to designate qualification at an intermediate level, if appropriate, for a specific shredout in AFSC 12BX. Level 1 identifies rated navigators at the entry level for their specialty. Current aeronautical rating and qualification for aviation service according to AFI 11-402, Aviation and Parachutists Service are mandatory for award and retention of navigator AFSCs. See AFI 36-2101, Classifying Military Personnel (Officer and Airmen) for policy on retention or withdrawal of rated AFSCs for personnel disqualified from aviation service or placed in an inactive status.